I said I would post some pictures of the wiring I've been doing when I commented on fitting an indicator warning gadget in Russ's recent thread, so there are a selection below. I've fitted an electronic fusebox/power distribution box into left hand fairing compartment and connected it to the battery with a fused 20A cable. I added a earth distribution busbar to this to provide additional points for wiring up the connections of accessories as the box only comes with one as standard. I'm using this to power my satnav, heated grips, and auxiliary lights in Acerbis handguards (when I get them fitted). I have also used this to power the USB and 12V sockets I fitted in the frunk which has has allowed me to tidy up the wiring by removing the fuse tap I had originally used to power these. The other thing I have done is extend the socket used for the sub-harness onto a cable which goes into the right fairing compartment, so that the sub-harness can now be located in that space which is more convenient for connecting up additional accessories, than it was under the LH side panel. 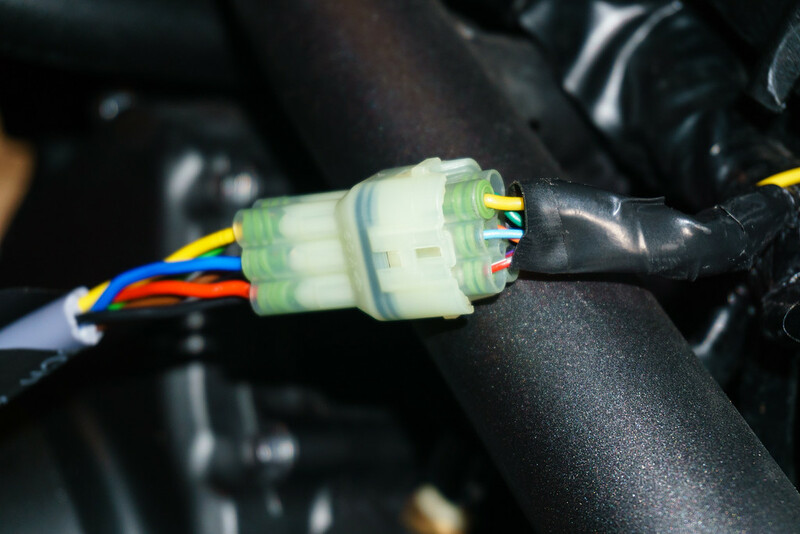 I've added a brake light feed into this cable which is missing from this socket on the NC750 though was present on the NC700. 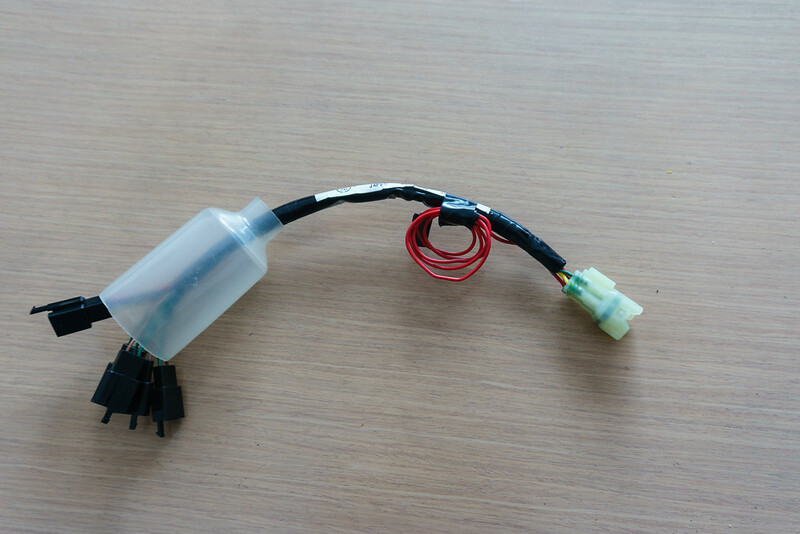 I've also modified the Honda sub-harness cable to include the other three connections, namely L and R indicator feeds and brake light feed. I've removed the existing connections from the single four way connector (you can remove pins if you use a very small flat bladed screwdriver to depress the locking latches) and used it instead for L and R indicator, brake, and earth. 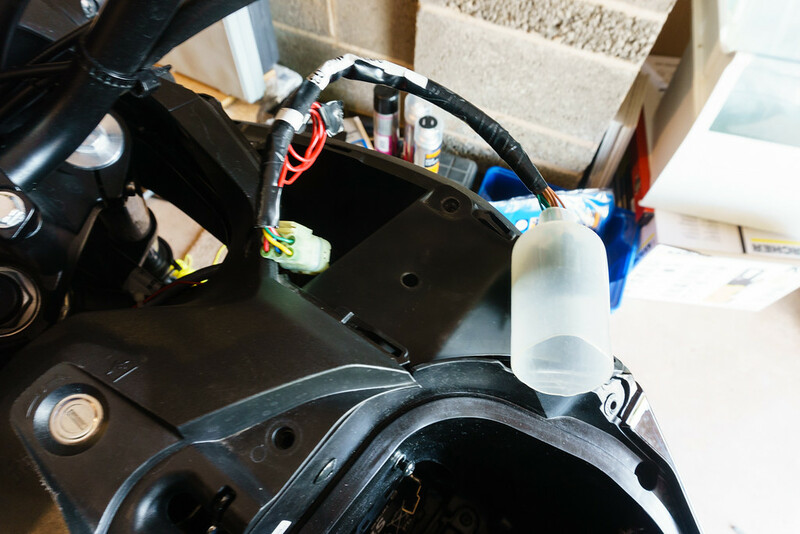 I've then put a matching four way connector on my indicator warning gadget to connect it to the modified sub-harness and sited it in the right hand fairing compartment. I re-used the switched 12V and earth from the 4 way connector to add another three way accessories connector, and left the unswitched 12 supply which was originally on the 4 way connector on a flying lead in case I ever have need of it. 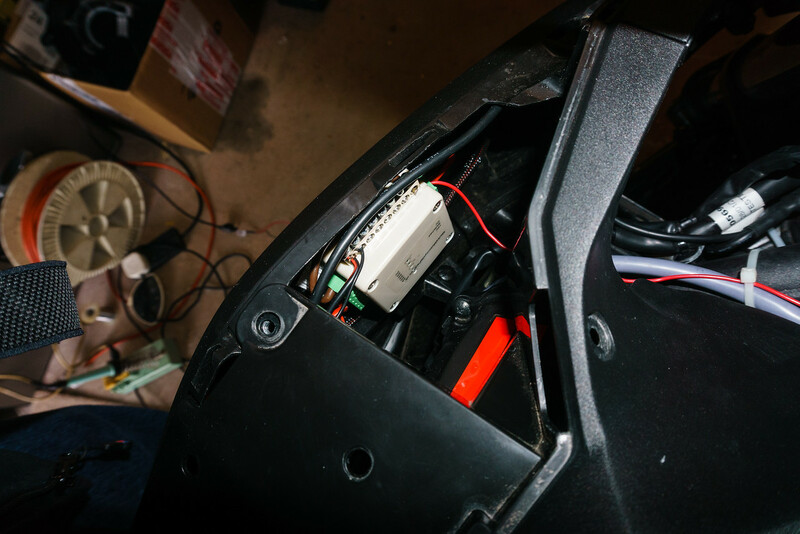 The final mod was to fit a 12V socket in the standard Honda location on the left side of the frunk but connect this up directly to the battery with a 15A fused lead. The purpose of this is to provide a charging point for my Optimate to plug in to, and also provide a high power source for running my mini tyre pump. 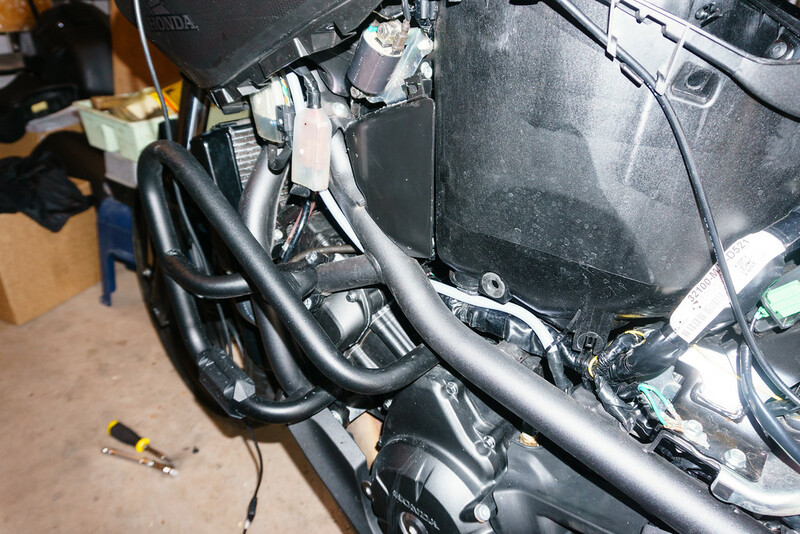 Modified sub-harness on end of extension cable, located in RH fairing compartment. The indicator warning gadget is connected to this and located in this space. As ever some neat jobs there then Fred, I've used that hidden little area up inside the nearside fairing like you as it seems well protected from the elements there, although my arrangement is no where near as tidy as yours! . Wow, thanks fred! Well thought out, and thanks for sharing and making the write up. 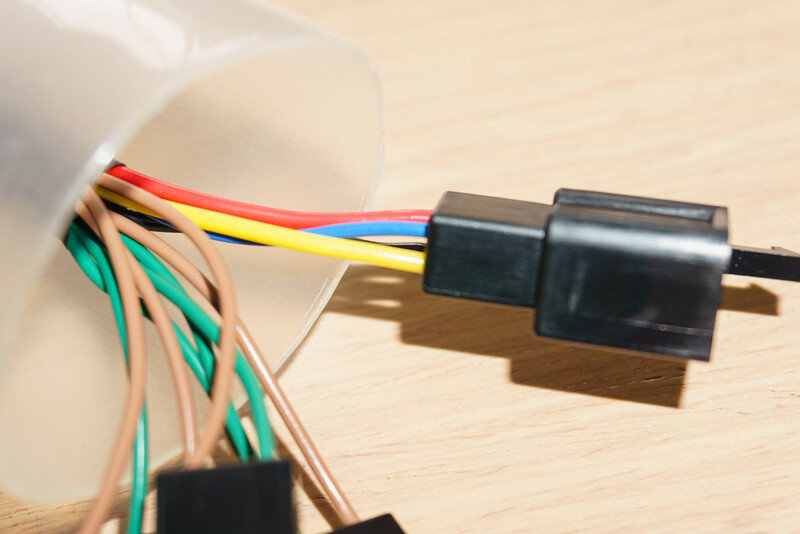 I'm also interested in making a sub-harness extension lead - you said before about 70cm long - can you share the wire colours/sizes and the source for the white plug & socket. Did you need the specialised Japanese tools (JIT?) for screws? How was getting the side panels off? Actually I used the full 1m length of cable following a late decision to route it across to the RH compartment instead of having everything in the LH one. It is just multicore DC cable, but I'll look for the emails regarding the sources of the parts and put up some links up if I can find them. I didn't need any specialised tools. Most of the fasteners used an allen key, there were a few of the plastic rivet things, and I think three screws which I was able to use a philips type screwdriver on. I'd been putting off taking off the side panels, but it wasn't as bad as expected. I did have a couple of problems dropping the plastic rivets holding the lower side panel onto the textured side panel as these are a little difficult to reach. managed to find them eventually, though I have bought some spares just in case. I also took the top panel off so that I could remove the airfilter housing and this has two little plastic pieces underneath acting as guides/shields for the frunck and rear seat release cables which I found a bit tricky to replace - should have taken some pictures when removing! The worst problem was right at the end when doing up the screw at the rear of the top panel covering the LH compartment where I put the wiring. These screws go into rubber well nuts in the frunck housing, and the left hand one must have pushed through and wouldn't tighten. After fiddling with it for some time got the screw out but the well nut dropped down and I heard it bouncing about but it didn't fall out onto the floor. Took all the panels off again to try and find it but no luck. Fortunately these are the same as the screen mounting well nuts and I had some spare as I've mounted my screen using nut plates to replace the well nuts. You also have to be careful with the tabs on the top panels and make sure they are all dropped into the mating holes before sliding forward. I found one of mine was already cracked - presumably due to the dealer taking it off the do the warranty service on the frunck lock. Well Len I have worked in electronics and computing all my life, so I guess it's not too surprising that I have some skills in those areas! However, I would say it is even more useful to have building skills like you. I struggle with that sort of thing and have to employ people - though I did do the plumbing and electrics on an extension once, at great cost to my sanity, and even more to my knee joints! Very nicely done Fred. Chapeau bas! Good idea Fred to spread out the parts to those panels each side of the bike. I think that's where I went wrong, taking everything to the nearside, when by taking it to the offside everything is going to be less cluttered. 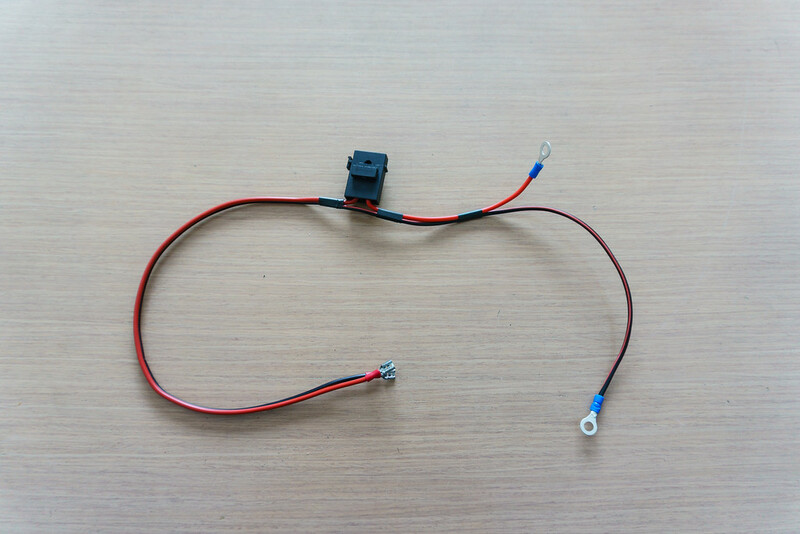 item number:121385764046 This is 11 amp per wire - sub-harness switched 12v supply is fused at 7.5 Amps so should be more than adequate. Having found out that the fuse in the harness is only 1A (12W) according to the installation instructions, I realise I'd need the same solution as you with an additional supply and relay, just using the harness input as signals rather than power source. I've found I need a separate 12V socket for the air pump so that's my starting point. The standard Honda 12V socket is powered off the sub-harness via a relay and a fuse which is limited to 7.5A in total for all accessories connected to it, but the Honda 12V socket has its own individual fuse in the wiring (which I think is only 1A) so you need to take the panels off the replace this fuse if you blow it. This makes it unsuitable for powering anything that needs a lot of power like a tyre pump. 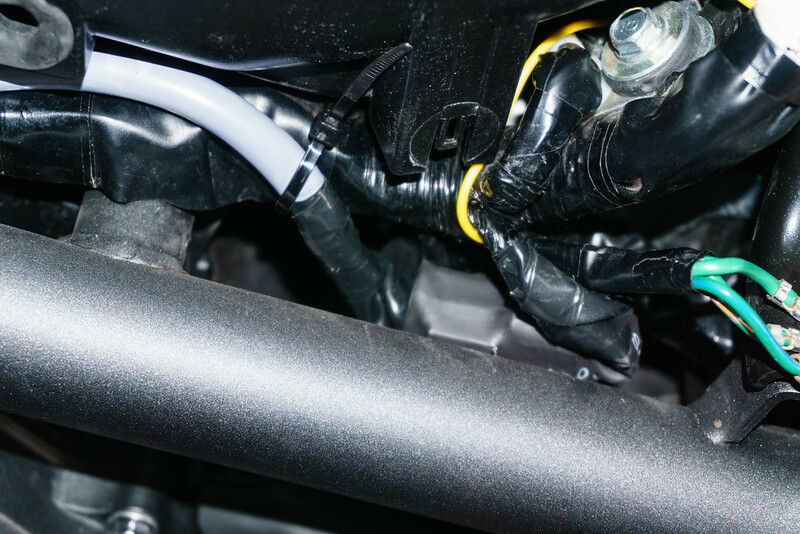 The other point about the Honda socket is that it is only live with the ignition on, so as the supply is switched on by a relay cannot be used as a 12V input point for battery charging, as there is no connection to the battery through the relay unless the ignition is switched on. What I've done is put a switched 12V socket and a USB adapter in the battery cover panel to avoid the need for the Honda socket. I have then used the location where the Honda socket normally goes to fit my own 12V socket. However unlike the Honda socket, this is connected directly to the battery via a 15A fuse, so can be used for high power items, and because it does not go through a relay can also be used with my Optimate and its 12V socket adapter lead, to charge the battery. I have picked up the switched live off of the honda socket to feed the relays on the Fuzeblock and tracker. I have gone straight off the battery and also put the optimate charge connector straight to the battery. I wouldn't know where to find the sub harness sockets on the Integra but managed to get the centre and side trim panels off without too much aggro. One of the Allen bolts holding the rear seat in place had already been rounded off which was a bit frustrating. Put it back with some anti seize on to help in the future. I have noticed the Allen bolts are very shallow when compared to the more conventional heads on the bolts on my CBF. I will be having fun running power up to the bars for the sat nav next. Almost 2 months old but never mind. 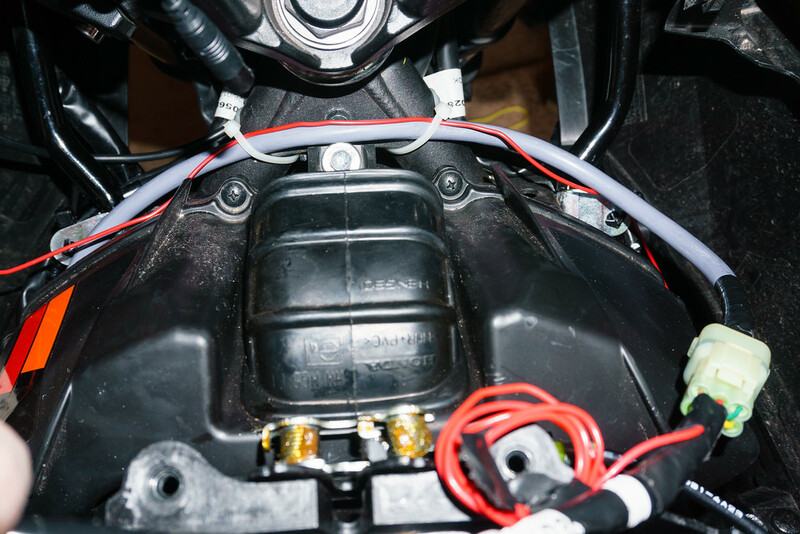 The sub harness socket for the integra 750 in behind the left front side panel as you sit on the bike sits above the ABS unit. Hi Fred, really impressed with with your wiring mods, especially the power distribution box, have looked for the one that you have used, but can't find one anywhere, can you share your source? Below are links to the items I bought for the power distribution box. The small 8 way busbar was screwed and superglued to the fuseblock box and then wired to the earth supply on the box so as to provide additional earth connection points. I used the screw which originally bolted on the plastic bracket and drilled a hole in the side of the box so that I could bolt it on to the outside of the box, secured by the superglue. Having this makes wiring stuff up easier. You will need to copy the following links and remove the spaces in the word e b a y before pasting into your browser. This is necessary because the forum automatically changes the word e b a y to "that auction site". 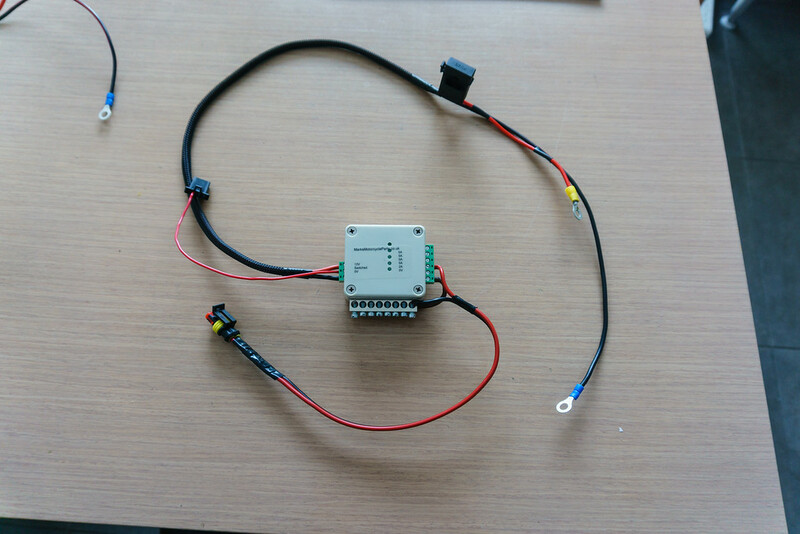 You will need to provide a fused supply from the battery to the fuseblock, plus an ignition switched 12V feed to activate the relay in the fuseblock and make the fused outputs live when the ignition is turned on. Fred, many thanks, need to get my NC750S powered up to maintain accessories I want to add for a sponsored 24 Hr John O'Groats to Lands End Ride in June. No problem, hopefully you should be able to get it all sorted before June, and good luck with the sponsored ride - sounds like tough one! Today I have working heated grips (in the nick of time!) and pumped the tyres up with my airman tour powered from the frunk. All due to this post. Fantastic post Fred! Thank you for this. Very informative. ta Fred . Just need to work out how favourite this post. 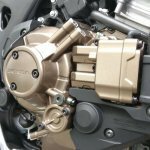 My new bike will be arriving with the honda 12v socket and it looks like it isn't going to do everything required.